We derive recursion relations for the anomalous dimensions of double-trace operators occurring in the conformal block expansion of four-point stress tensor correlators in the 6d (2, 0) theory, which encode higher-derivative corrections to supergravity in AdS7 × S4 arising from M-theory. As a warm-up, we derive analogous recursion relations for four-point functions of scalar operators in a toy non-supersymmetric 6d conformal field theory. 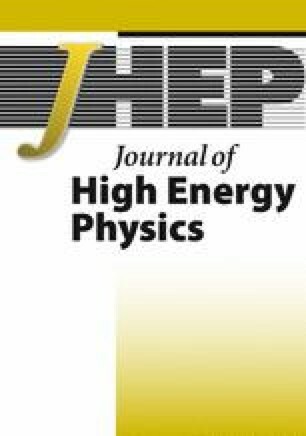 The online version of this article ( https://doi.org/10.1007/JHEP04(2019)038) contains supplementary material, which is available to authorized users. S. Ferrara, A.F. Grillo, G. Parisi and R. Gatto, Covariant expansion of the conformal four-point function, Nucl. Phys. B 49 (1972) 77 [Erratum ibid. B 53 (1973) 643] [INSPIRE]. A.M. Polyakov, Nonhamiltonian approach to conformal quantum field theory, Zh. Eksp. Teor. Fiz. 66 (1974) 23 [Sov. Phys. JETP 39 (1974) 9] [INSPIRE]. L.F. Alday, A. Bissi and E. Perlmutter, Genus-one string amplitudes from conformal field theory, arXiv:1809.10670 [INSPIRE]. L.F. Alday, On genus-one string amplitudes on AdS 5 × S 5, arXiv:1812.11783 [INSPIRE]. 1.Department of Mathematical SciencesDurham UniversityDurhamU.K.